Mother’s Day has come and brought all the attendant columbines and dandelions of spring along with it. 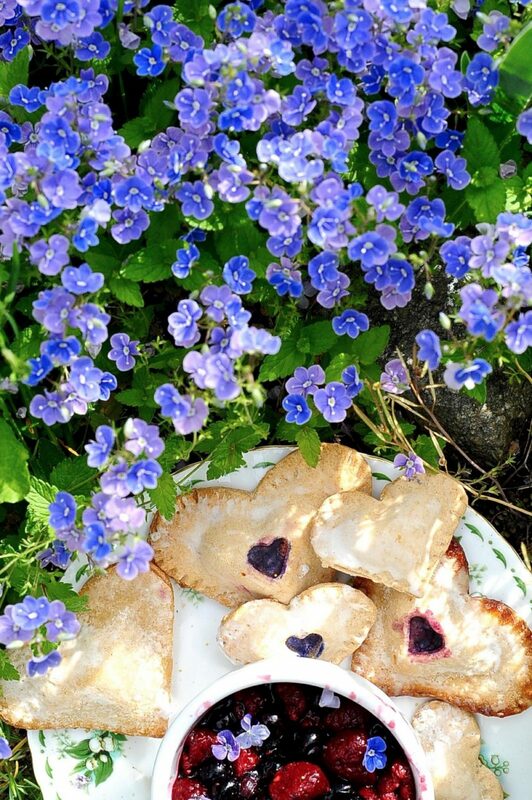 Bake your mom a batch of heart-shaped blueberry hand pies, pack a picnic lunch and share the day. 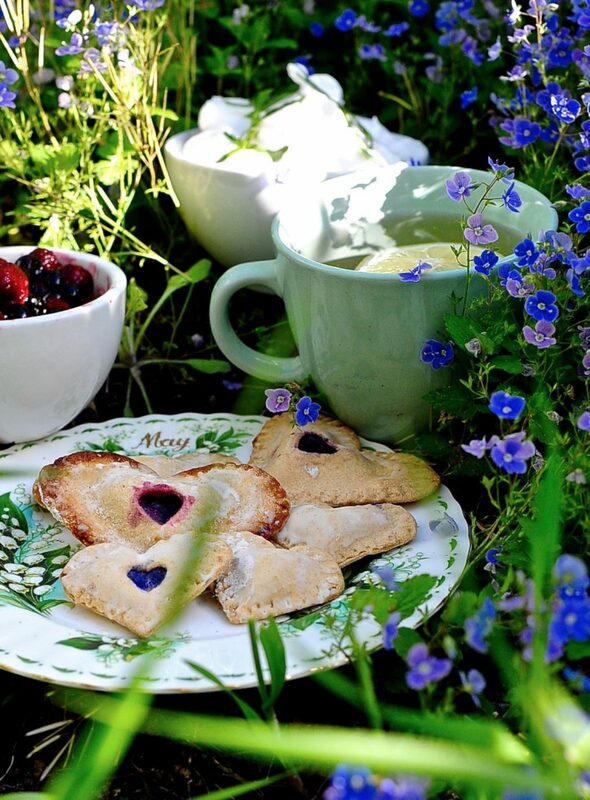 Flaky golden crust encapsulates sweet berries bursting with the promise of summer. I awoke one morning, in our last winter together, to a heavy snow fall. I drank my coffee in the grey hush of dawn and headed outside to walk my mom to work. We had houses side by side with a shared garden between us. Standing by her back door I could see bootprints leading from her back stairs and out to the street. The snow was coming down hard and it looked by the indistinct state of her prints that she had left about 15 minutes earlier. Silly me, of course she left early because of the snow. I followed her trail up our steep hill. Even if her foot prints hadn’t been there I would have been able to find her because she always took the same route in case I decided to walk with her or offer her a ride. So there I was walking up our street knowing that she had a head start but that if I put on the steam I could catch her. At the top of the hill I paused and scanned ahead. Still no sight of her. The world was silent except for the soft ploshes of wet snow. As I half slipped down the hill I saw that her footsteps had become more distinct and no longer softened with new snow. Each person who ever was or is or will be has a song. It isn’t a song that anybody else wrote. It has its own melody, it has its own words. Very few people get to sing their song. 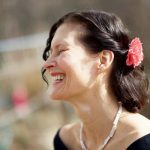 Most of us fear that we cannot do it justice with our voices, or that our words are too foolish or too honest, or too odd. So people live their song instead. I spotted her from half an block away. Walking behind her, watching her unaware and the anticipation of knowing that I was about to give her a warm surprise on a cold morning hurried my steps. I called out to her when I was about ten feet away so as not to startle her. She was delighted and we walked in companionable chit chat till we reached the boulevard. We neared a bench, cleared it of snow and sat down. Each morning she stopped for 10-15 minutes on a bench to savor the morning and the natural beauty around her. We sat together and shared a cup or two of steaming coffee from her thermos. In the white world with her silver grey hair and blue blue eyes she looked like a fairytale queen. I held her hand and we gossiped and chit chatted till time ran out and then I walked her to work. Walking home I felt light like a girl in love. In love with my mother. To touch her face was that always new experience of opening your window one December morning, early, and putting out your hand to the first white cool powdering of snow that had come, silently, with no announcement, in the night. And all of this, this breath-warmness and plum-tenderness was held forever in one miracle of photographic is chemistry which no clock winds could blow upon to change one hour or one second; this fine first cool white snow would never melt, but live a thousand summers. Fruity blueberries encased in flaky rich pastry and drizzled with lemon glaze. 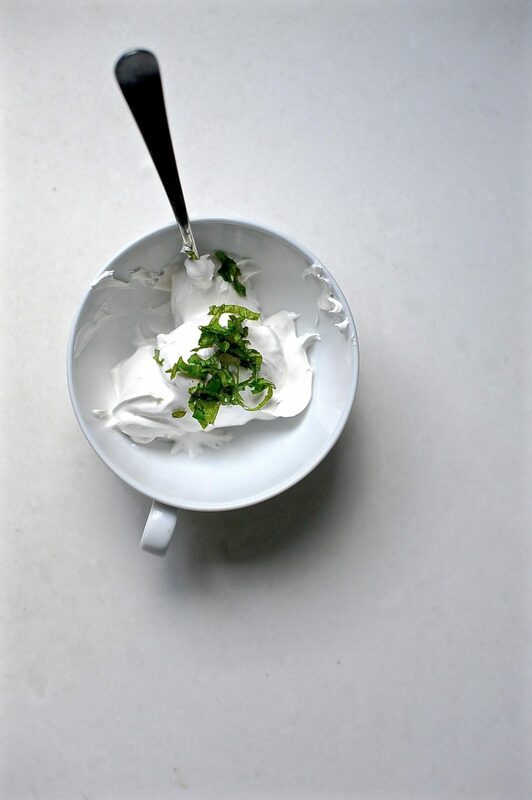 I serve mine with one bowl whipped sweetened aquafaba fluff into which I fold shredded basil to add brightness and another bowl with berries. Freeze these up and toss them in the toaster oven to defrost on a snowy morning. Into a wide bowl add your flour, lemon zest, salt and sugar. Cut your cold butter into small chunks and work it quickly into the flour with your fingertips until your mixture resembles damp sand. Pour 1/4 cup of the ice water into a cup and add 1 tsp vanilla extract. Poor the 1/4 cup of ice water vanilla solution into your bowl and work your dough until it will clump together in your hand if you make a fist around it. Add as little water as possible to reach this point. If it is sticky, you are ruined and need start over. Once you get the hang of it you will find this part easy. Add more ice water if necessary, but work quickly. Knead your dough 2 minutes. Divide your dough in half and form into two balls which you then flatten into fat disks, wrap in plastic wrap and place in the refrigerator to rest for one hour. 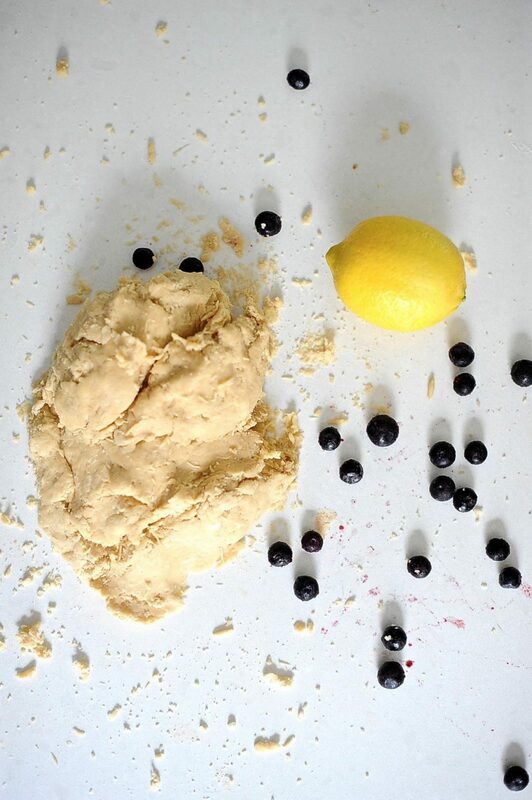 After an hour, remove one of your dough disks from the fridge. Heat your oven to 400 Fahrenheit. Line a cookie sheet with parchment. Toss your filling ingredients together in a bowl. Roll your dough out into a 1/4 inch nebulous shape. I know I should write rectangle but honestly it makes no difference in this case what shape you start with. Using your heart cutters, cut an equal amount of hearts. You could of course make rectangles. It is much simpler, but today is Mother's Day so let's put in a little extra effort, shall we? Place a small amount of filling on each heart. Prick the pastry heart you will be using as the topper with a fork. Or do as I did and cut out a smaller heart. You need some sort of hole as a vent for when the steam builds up during baking. Dip your finger in water and wet the edges of the bottom heart all the way around the circumference of the heart. 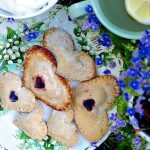 Firmly place the top heart over the filling and press all around the edges to seal, using a fork to reinforce the seal and make a pretty pattern around the edges of the pastry. If you are not making the glaze at this point you can paint the top of each pastry with soy milk and sprinkle with sugar. 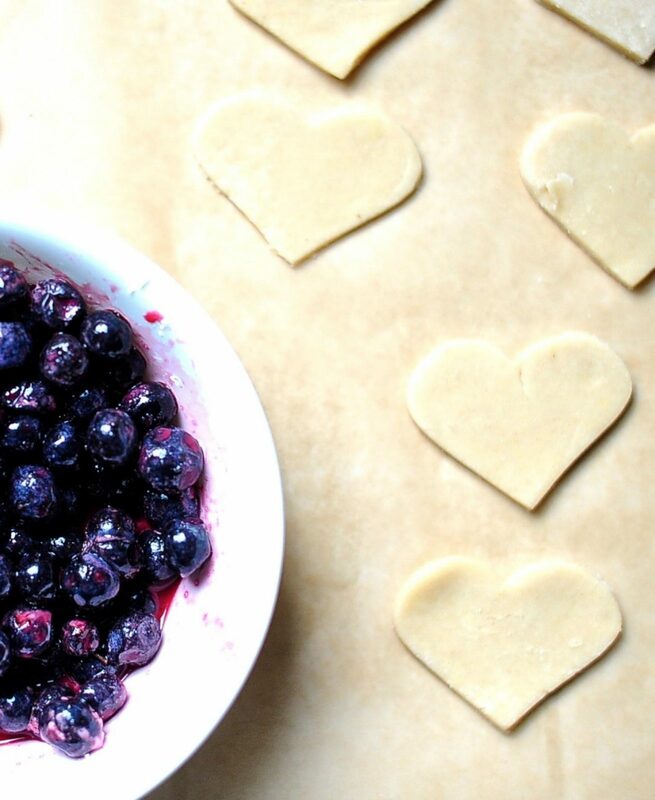 Place all your filled heart on the parchment lined pan and bake for 18-20 minutes. Beat together all of the glaze ingredients until you have a glossy thick glaze. It will thicken after 10 minutes so resist the urge to add more sugar until you see how it sets up. That Oscar Wilde quote is speaking to me right now! These look so delicious and perfect for mothers day! Cara thank you! I hope you are having a lovely day. We all loved (and still love) that sublime mother of yours. How much she loved you and your sister! She was the best mom I ever encountered. Such beautiful story, memory and bond between You and Rie. Loving mother and grown daughter. 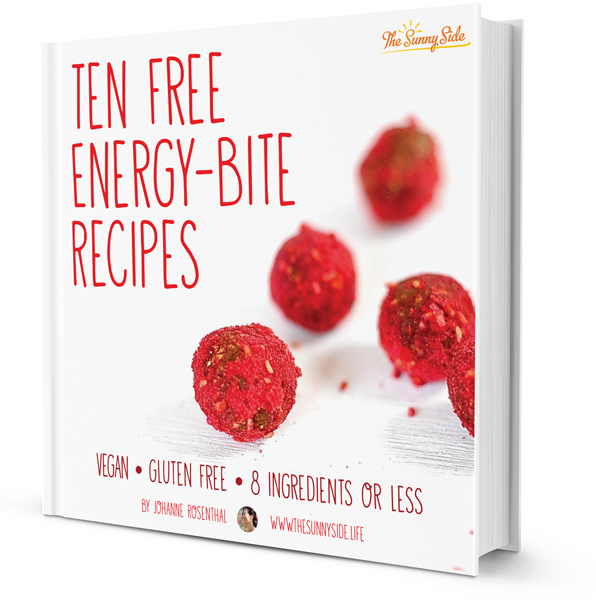 The recipe makes me salivate. When I cook chick peas or legumes I put salt in the water. I wonder if the taste of salt would spoil the deserts or bakery. Do you use aqua faba with or without salt?